What Can You Clean With Blue Clean AR383? AR has been in the pressure pumps and pressure washers game for more than 60 years. Nowadays, they specialize in manufacturing and engineering power washers such as the AR383. Considering that this is one of their most popular units, we have decided to test this model and compile the info in this unbiased Blue Clean AR383 review. We will go through the model’s specifications, provided accessories, cleaning capabilities and general warranty policies. The AR383 cleaning unit is powered by a 14-amp electric motor, which is able to put out the force of maximum 1,900 PSI at 1.5 GPM. This makes up a total cleaning power of solid 2,850. This model is considered a light/medium-duty pressure washer, and we have been able to tackle most of the presented challenges. This washer is beautifully designed and tightly packed into a compact unit that resembles a classic vacuum cleaner. The whole body is mounted on a 2-wheel system which, combined with the handle and a highly-functional hose reel, enables you to carry it around with ease. The portability doesn’t stop there, though. The AR 383 is extremely light, weighing at only 20 pounds. To help you cover a vast area, AR designed this unit with a 20-foot long high-pressure hose and a 30-feet long electric cord. When it comes to cleaning, the AR383 serves a great purpose around the yard. Provided with the mentioned essentials, there are additional 2 quick-change spray wands: an adjustable spray wand and a turbo wand. With this equipment, you are able to change the focus of the pressurized water stream and adjust it to the cleaning task at hand. To make the cleaning even easier and safer, there is a Total Stop System (TTS) installed, which means that the electric motor turns off when you let go of the handle. This prolongs pump life. If you decided to tackle sturdier stains, AR383 comes with a 14-oz. detergent bottle that can be attached to the end of the spray wand. This function enables you to soak the dirty surface with a cleaning agent of your choice and pre-treat the stains before blasting them off with a powerful spray. You should keep in mind that this washer is considered to be medium-duty, and cannot tackle the hardest of stains, but it is a great unit when it comes to versatility around your backyard. The AR Blue Clean company prides on keeping in touch with their customers and being available 24/7. They respond quickly and are able to replace any part you might need, from essential motor parts to additional accessories. Being that they are also in the game of industrial pressure washers, they have to keep their customer support top notch at all times. They offer a 1-year `bumper-to-bumper` warranty policy. It is highly recommended that you register the product after the purchase to get the best support needed. As abovementioned, this cleaner belongs to the light to medium-duty washer group, meaning that it`s ideal to tackle backyard/garden/patio tasks with it. 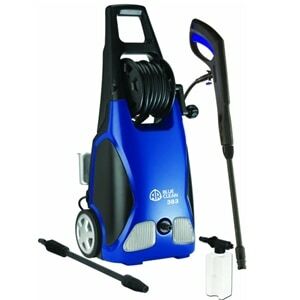 Various kinds of dirt, grime, moss, oil, and dust are no challenge for this power washer unit. We have tried it out on patio furniture, bicycles, cars and all kinds of surfaces found in a standard backyard. It’s also great for fragile surfaces like windows and plastics. It proved to be a solid washer, and truth be told, it even cleaned some marble and concrete surfaces from the driveway. But those did take more time. This pressure washer unit is astonishingly portable. Light-weight, tightly packed and wheel mounted, you can reach any part of your yard and store it with after use with such ease. The turbo spray wand gave an extra kick in washing, and the TSS is really useful if you take on some time-consuming cleaning tasks. Its user guide is also very helpful. It is important to keep in mind that this electric pressure washer is not a heavy-duty one and that it cannot tackle the harshest and most stubborn of stains. Also, the soap accessory`s size is sometimes not enough for a single cleaning session, so you will maybe have to refill. Demands are different, and this pressure washer will fulfill your cleaning needs, as long as you do not require an industrial-duty machine for the hardest of tasks. And the ratio between portability, power, and price is excellent. If you are looking to get a solid and versatile power washing unit, this model is a good purchase. Nowadays, power washers are available to everyone and you shouldn’t be an exception when they can save you so much time and effort. There you have it. We have presented all the pros and cons of our Blue Clean AR383 review to help you with your purchase decision. Consider all the facts, and select this unit if you think it’s time to save money on car washers or renting pressure washers for a day. If you can think of any additional questions, feel free to ask in the comment section below.